After coming off three straight loses, including their last two home games, the New York Rangers felt pressure to get the job done against the lowly Carolina Hurricanes. The Hurricanes came into this game without a victory. They had lost 3 straight to start their season. The Hurricanes were dealing with injuries to the Staal brothers, Andrej Sekera, and Jeff Skinner. There was no reason why the Rangers should have not come away with the victory but during the game you can sense that the Rangers were on edge. Even the fans were on edge and for most of the night it was quiet at the Garden. This was more evident in the 2nd period when Chris Terry scored to give the Hurricanes a 1-0 lead. Momentum would change in the 3rd period as Derrick Brassard tied the game with 10:20 left to play in regulation. 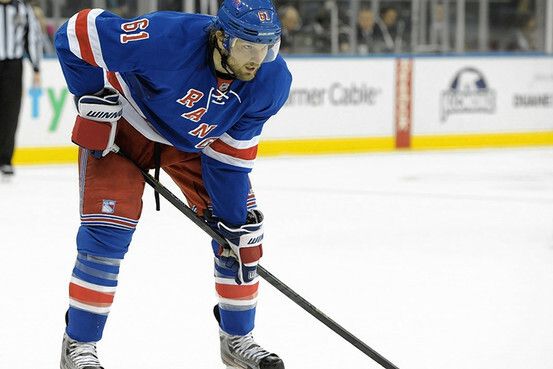 It was a nice goal assisted by both Dan Girardi and Mats Zuccarello. The game remained tied all the way through overtime setting up a shootout. In the shootout, Rick Nash continued his hot play and scored the lone goal. It was all the Rangers needed as Henrik Lundqvist shut the door on his end. He blocked all three shots from the Hurricanes and helped the Rangers earn 2 points and a victory in the standings. The final score was 2-1. – The Rangers struggled all night on the Power Play. They had five chances and could not convert on any of them. – The Hurricanes owned the Rangers on faceoffs. They won 44 to the Rangers 23. This will be a huge concern until C Derek Stepan returns. – Rick Nash is on fire. He leads the league with six goals. – Henrik Lundqvist was great tonight making 29 saves. He gave up one goal on 30 attempts. The Rangers continue their home stand welcoming in the San Jose Sharks. The Sharks are coming off a tough shootout loss to the Islanders. They will go to New Jersey to play the Devils on Saturday before coming to the Garden. The puck hits the ice at 5pm.